Weight loss never comes easy. And losing that stubborn belly fat can be the most difficult and frustrating part of the process. Sit-ups might help you build abdominal muscles, but they won’t burn fat. That’s why we developed Thyrovate, a stimulant-free, fat-burning accelerant clinically formulated to target the midsection and, more specifically, that troublesome belly fat. Thyrovate is an advanced weight loss supplement that is completely stimulant free, preventing shakiness, crashing and other symptoms common to overstimulation. Instead, Thyrovate uses a formula of premium quality natural extracts to suppress appetite, accelerate fat loss and increase your natural resistance to stress chemicals so you can stay at the top of your game. Its stimulant free nature allows it be an option for those who need to avoid stimulants due to other medications. Unlike other stimulant-free weight loss supplements, Thyrovate focuses on natural ingredients for easy absorption and specifically targets fat around the midsection. It also makes it a perfect complement to other stimulant based fat burners, such as Pyroxamine, to stack synergistically to enhance results. Many of our competitors promise big results with unsubstantiated claims, but Thyrovate uses premium quality, all-natural, clinically researched ingredients for a superior fat-burning matrix. At Myokem, we focus on providing unique formulas with top quality ingredients that deliver results. We’re not afraid to use unique, exotic ingredients that most supplement makers won’t go near because they are too expensive. We don’t offer false promises and we don’t pour money into absurd marketing campaigns with unfounded hype. We don’t hide behind proprietary blends nor do we use cheap fillers. Other supplement manufacturers tend to be more concerned with profit margins and asset turnover than their customers’ health, so they take shortcuts by using inexpensive fillers that can have scary side effects with dangerous repercussions and purchase their raw materials from shady sources with no guarantees of their freshness or potency. At Myokem, we ensure that every product we make is clinically tested for purity, identity verification, and dosage so we can guarantee that what’s supposed to be in your supplement is actually there. Take two (2) capsules first thing in the morning with food (or with your first meal of the day). Take an additional two (2) capsules with your evening meal. 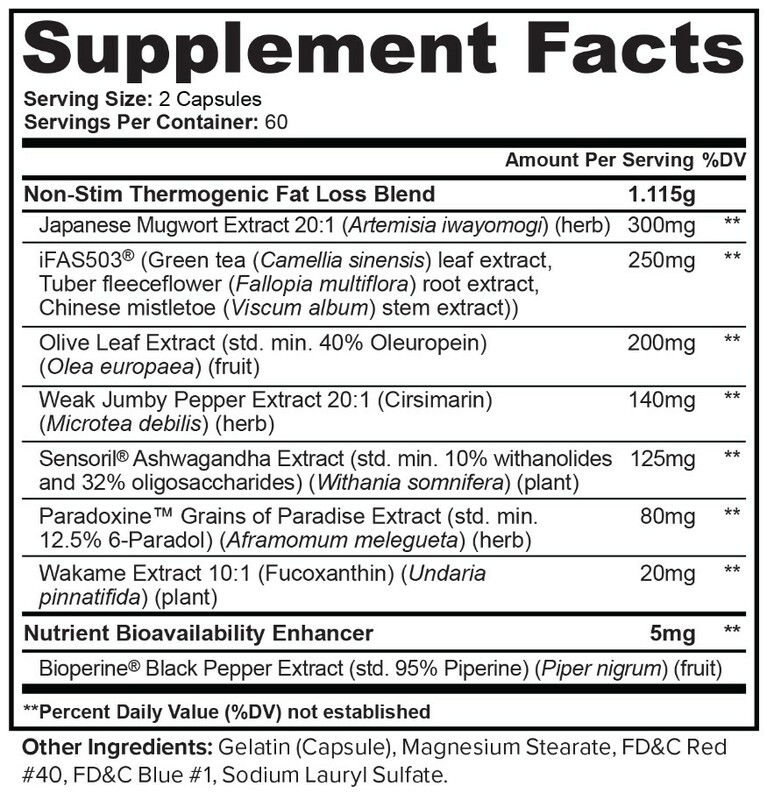 Do not exceed two servings (4 total capsules) per day. Drink 8-10 glasses of water daily while taking Thyrovate. For best results, pair with an exercise program and healthy eating habits. While Thyrovate does not contain caffeine or stimulants, it is important to understand that it is still a powerful, clinical-strength fat burning formula and should be taken only as directed. Do not use if pregnant or nursing. If you are taking prescription or over-the-counter medication, or have a medical condition, consult your physician or licensed healthcare professional before use. Do not use if you are taking an MAO inhibitor. Before beginning any weight loss or fitness program, consult your healthcare professional. Keep out of reach of children. Due to the unique restrictions of many organizations (Law Enforcement, Military, WADA, IOC, NCAA, NFL, MBA, NBA, etc.) it is recommended that you consult with the appropriate governing body before taking this or any other dietary supplement.